I’ve been reminiscing lately about my grandmother, Veronica Mary, whom we lost and Heaven gained two years ago today. It is a precious gift on this anniversary of my beloved grandmother to be the cannonisation day of our beloved Mary MacKillop, Nanna was educated by the Josephite nuns and in turn her own children and grandchildren. My Nanna had a beautiful faith; a simple, strong faith. Her relationship with God was very personal, He was a loving, approachable Father. Her life was not easy, with many losses and disappointments, but through it all she clung to her Faith. At the age of 7 she lost her own mother an event that had an enormous impact on her life, Our Blessed Mother became her mother, she was strongly devoted to her. A Grandmother can have a strong influence on her grandchildren. Certainly mine did and she influenced my own Faith immensely, my own relationship and ‘picture’ of Our Heavenly Father has been heavily influenced by hers. Nanna’s God was a forgiving God; you sinned, you repented, you picked yourself up, dusted yourself off, said sorry and got on with life again. He understood stumbles, He was always ready to accept and love. For big events; a new baby, a death, she would call us all to prayer, we would gather ’round, fall to our knees and pray the Rosary. One of my most happiest memories is, when in my teens I joined the Legion of Mary with my Grandmother, and her contemporaries, the other faithful ladies of the Parish. The strength of prayer in that little room, the home visitations, bringing a sense of God and community to the shut ins, seeing Faith in action was a powerful witness. Nanna wasn’t afraid to talk about God to my cousins and I; some were being raised in Catholic homes, some weren’t, she just shared her Faith regardless, her Faith was a natural breathing part of who she was. Those lessons stuck with all of us, they took root, and one day…, well I keep praying and I know she is. Nanna had many sad crosses; children who left the Faith, divorced, custody battles etc, she was a worrier. She made herself sick worrying. I remember her reaching breaking point in my teens, she said, “I’ve reached my limit, no more worrying, I’ll just pray.” And she did, from that moment she gave it all to God and trusted in Him. To this day when I start to worry, I stop and pray, worrying is useless, but prayer isn’t. In the end she was longing to go to Heaven, to meet God and to see her husband, son and mother again. I watch grandparents in my parish bringing their grandchildren to Mass and I know the seeds they are planting are taking root, no doubt they wonder at times if they make a difference (I know my grandmother did) but those seeds will bear fruit. I love you Nanna, Rest In Peace. « The Big Day Has Arrived!! Erin,what a wonderful inspiration your Nanna sounds. I love that part you shared about "no more worrying just praying" and will try to remember it all the times i do waste time worrying,thank you so much for sharing! Hi Erin, thanks for stopping by to visit me at Bugs, Beetles and Barefoot days. I sure am glad you did – this post was such a blessing!! What a lovely tribute. It is indeed nice to find a fellow blogger sharing the same seasons ;o). Look forward to many more visits here. Hard to do but so worth it. I was pleased to find your blog:) What a thriving hs community there was in Sth Africa, great to 'meet' somebody else from the Sth Hemisphere. What a beautiful tribute! God bless you! This is beautiful! It's amazing how much Grandparents can influence our faith formation. for sharing this with me, oh my heart swells, as do my tears, the love i felt whilst reading this was just amazing, such an inspiration to all who read it, even now, your Grand mother is teaching and guiding, you, and all of us.Thankyou so much. Erin, this is so, so beautiful. Your Nanna is the kind of Grammy I hope to be. Thank you for sharing your link about letter-writing with me today. It led me to this, and I am so inspired to stop worrying (something I also do very well!) 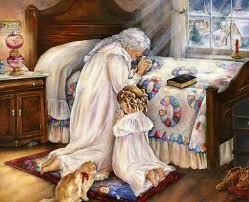 and pray more, and to be the best grandmother I can be!